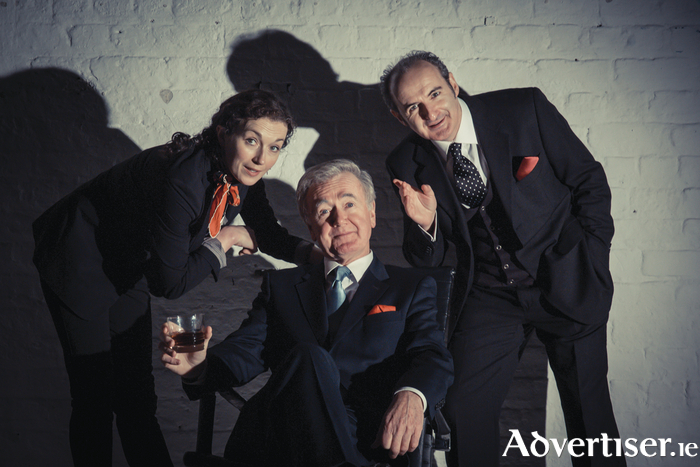 Tara Breathnach, Bryan Murray, and Michael Bates in Dave At Large. DAVE AT Large, a new comedy starring Bryan Murray, of Fair City and The Irish RM fame, tells the extraordinary story of the controversial and ground breaking Irish comedian Dave Allen, whose rise to fame saw him become one of the most challenging yet popular comedians and television personalities of his day. The play, which comes to Galway this month, was written by Brian McAvera, who takes an unorthodox approach to the story, deploying three actors, one of whom is female, to portray Allen and also re-imagining his routines for a modern-day audience. Allen was born as David Tynan O'Mahony in Firhouse, Dublin, in July 1936, the youngest of three sons. His father was Cully Tynan O'Mahony, managing editor of The Irish Times, while his mother, Jean Archer, was from England. Allen's first television appearance was on the BBC talent show New Faces in 1959. At the height of his career in Britain, he regularly provoked indignation for his frequent satirising of religious authority and political hypocrisy. The ‘female Allen’ is portrayed by Tara Breathnach, while the ‘stage Allen’ is played by Michael Batres, with Bryan Murray as the 'TV Allen'. “It is not a conventional biographical show,” McAvera admits. “None of us are a single personality; we are like a collection of selves or roles and we all have a female as well as a male side. "In writing the play, because so much of Allen’s humour and attitudes stemmed from childhood and his relationship with his parents, I wanted to be able to access those, but not from the overtly comic persona of either the stage or TV Dave Allen, so it made sense to have a character who is partly like one of your sisters and part like your mother; she lets you access the emotional element that most men try to hide. As well as being a dramatist, McAvera is also an art historian and has written plays about Picasso and Francis Bacon. His career in theatre, as both director and writer, goes back to the 1960s and I ask if he ever encountered Dave Allen in person. “I never met him but I did see him live,” he replies. “Whereas on TV he was very relaxed and laid back, on stage he was quite different. He roamed the stage rather than sitting down. He was much more aggressive and he worked the audience in a way that an actor does as opposed to working to the camera. He was astute enough to know that he couldn’t do the same kind of performance in two different mediums. McAvera reveals that the play draws as much from his own life as that of Dave Allen: “While it uses some elements from his biography it uses just as many from my own. There were points that Allen and I had in common; his first gig was at Butlins and oddly enough my first job was at a Butlins in Somerset.